Cleo was dying of cancer. She was still strong enough to come to church and go to appointments, but the doctors had told her there was nothing more they could do. The cancer would soon end her life. She was 62 years old and her husband had just retired. They had lots of friends and plenty of money and all kinds of plans. With John now retired, they would finally have time to enjoy life. But the cancer ended all their plans. Now I am about to go the way of all the earth. 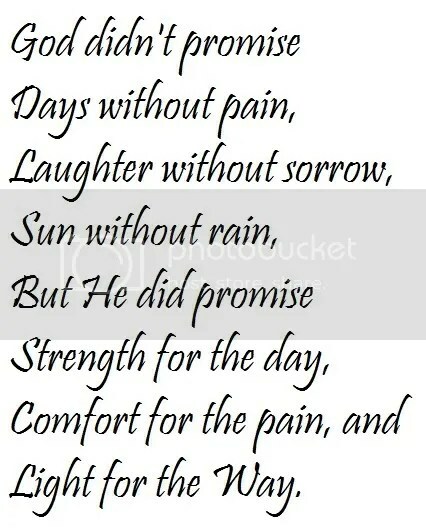 You know with all your heart and soul that not one of all the good promises the Lord your God have you has failed. Every promise has been fulfilled; not one has failed. One might wonder why Cleo picked that verse. There are many other verses in the Bible that would seem to fit her situation better. In the Psalms there are many complaints about the unfairness of life; and no one could have blamed Cleo for thinking it was unfair for her to be dying when all her friends were making plans and doing things and going places. And if she did not feel it was polite to complain to God, there are those other Psalms that simply express the sadness of life in this disappointing world. Or, she could have selected Jesus’ own words as he was dying, quoting Psalm 22:1, “My God, My God, why have you forsaken me?” She certainly could have felt forsaken by God. But Cleo did not choose any of those verses. Rather, she chose a verse that expressed her faith and her gratitude and her confidence in God. “All of God’s good promises have been fulfilled for me,” she said, making Joshua’s words her own. When you think about it, she was right. God never promised her, or any of us, a long life and the time to fulfill all our plans and dreams. God never promised that we would not face disappointment. God did not promise that we would never have to leave our loved ones behind. In fact, none of those things that Cleo would be missing out on were ever promised to her, or any of us, by God. What God has promised is the strength to meet each day– and Cleo was certainly staying strong. God promised comfort in the midst of even life’s greatest tragedies and suffering– and Cleo certainly was experiencing that comfort even during this, the most terrible time of her life. And things were going to get even worse for Cleo. She would endure much pain and suffering before she died. Yet, she had that ‘peace that passes all understanding’ even unto her dying breathe, and all who saw her were inspired by her faith. 2 Corinthians 4:16-18 — Therefore we do not lose heart. Though outwardly we are wasting away, yet inwardly we are being renewed day by day. For our light and momentary troubles are achieving for us an eternal glory that far outweighs them all. So we fix our eyes not on what is seen, but on what is unseen, since what is seen is temporary, but what is unseen is eternal.